The John W. Engeman Theater in Northport was a sea of blue princess dresses last Saturday morning at the theater’s opening of the classic fairy tale, “Cinderella.” Directed by Jennifer Collester Tully, the story follows the original plot closely with lots of fun and laughter. The inclusion of a few younger actors is a nice addition, making this show the perfect choice to introduce children to the magic of live theater. Allie Eibler stars as the sweet and innocent Ella, a young girl whose father dies, leaving her at the mercy of her evil stepmother and mean stepsisters. Forced to do all the chores and sleep in the kitchen by the fireplace, she is nicknamed Cinderella. Her miserable plight attracts the attention of her fairy godmother, played wonderfully with a warm Southern accent by Suzanne Mason, who is determined to rescue her. Aided by her helpers, energetic 13-year-olds Ryan J. McInnes and Meaghan Maher (both last seen in “A Christmas Story”), the fairy godmother arranges for Cinderella to attend the royal ball, where she steals the heart of the young prince, played by the handsome Michael Verre, and, after the shoe fits, lives happily ever after. The talented Maryellen Molfetta plays the role of the stepmother with just enough selfishness and greediness, and Alyson Clancy as Henrietta and Kate Keating as Gertrude are hilarious as the jealous stepsisters. It is the incomparable Kevin Burns, however (seen most recently as the Cowardly Lion in the “Wizard of Oz” and as Frosty in “Frosty the Snowman”), in the role of the king, who steals the show. Blind as a bat, he fumbles around the set, always headed in the wrong direction, mistaking a topiary for a guard, and almost falls off the stage at one point, drawing the most laughs. There is a lot of audience interaction in this show — something the kids just love. The actors walk up and down the aisles during scene changes, serving as a nice distraction. The king even wanders up and down the aisles with Cinderella’s glass slipper, asking little girls to try it on as the prince stands by with eager anticipation. Even the youngest guests won’t have time to grow restless as they participate in “The Sneeze Polka” dance and are asked questions by the cast. Meet the cast after the show for pictures and autographs. An autograph page is conveniently located in the back of the program. The John W. Engeman Theater, 250 Main St., Northport, will present “Cinderella” on Saturdays at 11 a.m. and Sundays at 10:30 a.m. through May 10. Tickets are $15 each. For more information, call 631-261-2900 or visit www.engemantheater.com. Though A Chorus Line may be produced consistently, it is always refreshing to see a good quality, professional, local production. This is exactly what you’ll get when you see the Tony Award winning musical running through May 10th at Long Island’s stunning John W. Engeman Theatre in Northport. The large Broadway caliber cast is wonderfully directed by Engeman vet Drew Humphrey with Dena DiGiacintooverseeing the choreography. The tale, as we know, written by James Kirkwood and Nicholas Dante, follows several actors going through the audition process to be cast in an upcoming musical. This is set to the iconic Marvin Hamlisch/Edward Kieban score that includes favorite songs “One” and “Sing!” among others. What’s beautiful about this piece is that each member of the ensemble cast gets to shine. They truly make you feel their tension and the stressfulness of the entertainment industry. As the auditions for the fictional musical progress, Zach, the show’s director portrayed by James Ludwig, proceeds to ask each person about themselves. The stories vary and some will bring you to tears. Among the highlights is an emotional story from Cassie, portrayed by Jessica Lee Goldyn, who then interprets her angst into a stunning and inspired dance performance. Everyone in this cast is really brilliant. Additionally, special kudos to Cory Pattak for the excellent lighting design bringing the bare stage alive. The “auditions” take place in an undecorated/unfurnished room with only a ceiling-high mirror upstage. It takes a one-of-a-kind cast to keep an audience’s attention with minimal sets and props and the sold out crowd responded well. And, naturally, it is always delightful to see a live orchestra this one superbly conducted by Music Director James Olmstead. And so, A Chorus Line is certainly another hit for the John W. Engeman Theatre. A marvelous cast, a great story, beautiful music, and a top notch creative team make for a thrilling night of theatre. A Chorus Line is presented by the John W. Engeman Theatre of Northport, Long Island, through May 10th. Book byJames Kirkwood and Nicholas Dante, Music by Marvin Hamlisch, Lyrics by Edward Kieban, Directed by Dew Humphrey, Scenic Design by Jonathan Collins, Costume Design by Tristan Raines, Lighting by Cory Pattak, Sound Design by Laura Shubert, Casting by Scott Wojcik & Gayle Seay, Stage Management by Bethany Sortman, Music Direction by James Olmstead, Choreography by Dena DiGiacinto. For more information and to purchase tickets please call (631) 261-2900 or visit www.engemantheater.com. “Everything was beautiful at the ballet” is one of the most recognizable song lyrics from “A Chorus Line.” A similar line, “Everything is beautiful at the theater,” could be the overall theme of the 1975 musical, which won nine Tony Awards and a Pulitzer Prize in 1976. For the characters in this show about show business, no matter the ups and often painful downs of auditioning, they are never sure they will get a job or, if they do, how long it will last. 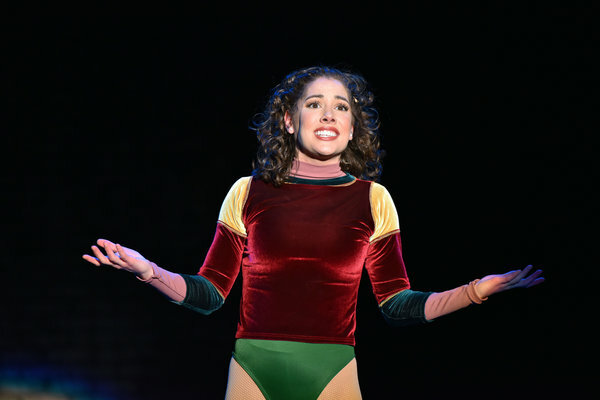 That brave outlook, and many other issues that “A Chorus Line” tackles, have not changed much over the last 40 years, which helps to keep this paean to musical theater and a dancer’s life feeling fresh and contemporary. A big part of the charm of the high-energy production at the John W. Engeman Theater at Northport is that its youthful cast members seem to be expressing their own joys and tribulations through the songs they sing, as a chorus and individually. Nearly the only way to tell that decades have passed since the original production, which was based on real stories from some of the participants, is that when the dancers give their birth dates, they reveal that they were born in the 1940s or early 1950s. Most of those original cast members and contributors of the tales that were woven into the musical’s fabric by James Kirkwood and Nicholas Dante, the book writers, are now eligible for Social Security. Thanks to Drew Humphrey’s sharp direction and Dena DiGiacinto’s snappy choreography, the stories and emotions that unfold — some of them more than a little sentimental — carry an urgency similar to the original’s. Scott Wojcik and Gayle Seay did an excellent job casting the show with spunky performers, many of them just starting their careers. Among the standouts is Stephanie Israelson, who delivers a mischievous“Dance: Ten; Looks: Three,” the comic song in which her character, Val, sings about how silicone and surgery helped her get roles. The fun she’s having with Edward Kleban’s clever lyrics and Marvin Hamlisch’s music, robust here but often lyrical in other songs, is infectious. Kelly Sheehan’s Sheila, the sardonic, nearly 30-year-old dancer who has the guts to refer to herself as a woman, not a “girl,” strikes just the right poses and attitude. Because she wears a costume similar to the leotard and tights worn by Kelly Bishop, who won a Tony during the original production, she sometimes looks as though she is portraying Ms. Bishop. But her performance is her own. In many ways, the staging here, including the set by Jonathan Collins, the lighting by Cory Pattak and the costumes by Tristan Raines, follows the template created by Michael Bennett, who is credited with conceiving, directing and choreographing the original. It truly was, to borrow another lyric, “one singular sensation,” both in form and content, and the revivals I have seen have not strayed far. The trick is to make the elements appear organic rather than a copy, and the Engeman team has achieved that. The band, under James Olmstead’s direction, provides solid musical support. The Engeman is also fortunate to have a strong Cassie, a dancer who was on her way to stardom but is now begging Zach, her former lover, for a spot back on the chorus line. Jessica Lee Goldyn, who played Val and Cassie during the show’s 2006-08Broadway revival, shows off an elegant line and virtuosic twirls during her solo, “The Music and the Mirror.” More importantly, she conveys Cassie’s anguish and hard-earned maturity in coming to the realization that she is not meant to be a star and is satisfied — even proud — to dance “like everybody else” and be part of a chorus line. “A Chorus Line” continues through May 10 at the John W. Engeman Theater at Northport, 250 Main Street. Information: engemantheater.com or 631-261-2900. Truth be told, I wasn’t looking forward to seeing “A Chorus Line” for the who’s-counting?th time. prove Zach’s point. Although she says her character can’t act, Goldyn, indeed, can. honor to the late Marvin Hamlisch’s energetic, emotive score. I almost didn’t mind driving home in an unrelenting spring snowstorm. May 10, John W. Engeman Theater at Northport, 250 Main St.
A Chorus Line, this classic musical with music by Marvin Hamlisch, lyrics by Edward Kieban and a book by James Kirkwood and Nicholas Dante, first opened in 1975. It received immediate acclaim, and has won nine Tony awards, the Pulitzer Prize for Drama, seven Drama Desk awards, the New York Critics’ Circle award and the Olivier Award. It became the longest running show in Broadway history, until 1997 when it was exceeded by Cats. With drama and humor, poignant emotion and dazzling dance numbers, there is something for everyone, keeping generations of audiences coming back for more. This production of A Chorus Line is the perfect storm of vision, ability and creativity. When? 1975. Where? An empty Broadway stage. Who? Seventeen hopeful dancers at an audition. Why? ‘Cause God they really need this job. But as it turns out, ‘How’, is the real question. How did they all come to be here? How did they begin dancing in the first place? How did this become their life? Through the grueling physical and emotional audition process, we are given glimpses into these dancers’ pasts and how they became who they are. Directed by Drew Humphrey, the Engeman’s production of A Chorus Line is superb. The cast is amazing, the crew is on point, and the talent of the direction is obvious. Stunning choreography by Dena DiGiacinto was performed with seemingly effortless execution from start to finish. The stage was simply, yet perfectly styled by Scenic Designer Jonathan Collins, while accurate Costume Design by Tristan Raines seamlessly reflected each character’s personality. Beautiful lighting effects by designer Cory Pattak, and wonderful sound design by Laura Shubert brought depth and emotion to many scenes. As always, the orchestra under direction of James Olmstead was fabulous. Every single person in this large cast deserves commendation on their performances. Loaded with triple threats, the accuracy, ability and pure talent of these performers will blow you away. Beautiful voices, incredible dancing and true believable emotion come from every angle. The characters run the personality gambit from the snooty Sheila (Kelly Sheehan) to the adorable Judy (Sissy Bell), the young Mark (PJ Palmer) and the short but feisty Connie (Alexzandra Sarmiento). Some of the most memorable moments include the incredible dance solo called “The Music and the Mirror” by Jessica Lee Goldyn as Cassie, the lovely singing of Abby Church as Maggie, and the humorous duet of “Sing!” with Rachel Marie Bell and DJ Petrosino as Kristine and Al. The rest of this impressive cast consists of: Frank (Patrick Ball), Roy (Nic Casaula), Greg (Hayden Clifton), Larry (Matthew Couvillon), Vicki (Courtney Fekete), Paul (Omar Garibay), Tricia (Francesca Granell), Mike (Eric Greengold), Valerie (Stephanie Israelson), Zach (James Ludwig), Bobby (Andrew Metzgar), Bebe (Courtney Moran), Diana (Maria Cristina Slye), Don (Michael Warrell), Lois (Sari Weinerman) and Richie (Danny Wilfred). This production of A Chorus Line is the perfect storm of vision, ability and creativity. All of the necessary factors interweave to affect the quality of the final marvelous creation. Thoroughly enjoyable from the opening scene down to the spectacular final number. Running Time: Approximately 2 hours with one 15 minute intermission. Advisory: Mature audiences – Cursing and many sexual references. A Chorus Line will be running at the John W. Engeman Theater in Northport, until May 10th, 2015. The theater is located at 250 Main St. Northport, NY. For tickets call the box office at (631) 261-2900 or click here. “A Chorus Line” opened at the John W. Engeman Theater in Northport last weekend and was a top-notch terpsichorean treat! If your scribe could marshal more alliterative allusions evoking the theatrical theophany that burst forth last Saturday, he would be demeaning the meaning of accurate critical acumen. But enough of Roccoco doggerel! The show, directed by Drew Humphrey was, well, a smash hit. Since it was all about dance and nothing but dance, a word about the choreography is in order. Dena DiGiacinto was in charge, and her fully charged crew put out a potpourri of evolutions and contortions in every genre including tango, tap, ballet and culminating in an all-hands-on-stage finale entitled “One,” which brought out a standing ovation rife with shouts of “Bravo!” DiGiacinto is immensely talented, having played a role in it on Broadway. However, she is the one who managed the unbelievable precision, coordination and aesthetic unitive finality that was a tribute to the totality of the show. Since dance requires music, there was James Olmstead leading his magnificent crew with associate Bob Kelly and featuring Joe Boardman on trumpet, Brent Chiarello on trombone, Russ Brown on bass, Mark Gatz on reeds and Josh Enflich on percussion. In your scribe’s opinion previously expressed about this band, they could easily supplant a Broadway pit outfit including its string section. The main lead is Zach, the choreographer charged with getting a chorus line in shape for a forthcoming performance. He is played by James Ludwig who reveals not only talent in dancing but a genuine stage presence as an actor. He even appears as a dancer in that knockout finale. Then we have Jessica Lee Goldyn as Cassie who gives an empty-stage dance solo in “The Music and the Mirror” as well as an emotional dialog with Zach that can only be described as riveting. In another number entitled “At the Ballet” Kelly Sheehan, Abby Church and Courtney Moran manifested evident skill. Patent progress was also evident in Danny Wilfred’s performance as Richie. It should be remembered that every single person on the boards is a dancer. There are no walk-ons, no characters who have only dialog — it is dance and music all the way. Lighting was effected by Cory Pattak who handled the fast-paced action with consummate skill. There was no set. Even the back wall upstage was seen; after all it was rehearsal and audition time. Laura Shubert on sound design made her ability to balance, increase/decrease, volume shine through. Your scribe even picked up a brief solo by Josh Endlich played on sizzling high-hats. The beats of all the numbers was so complete that your scribe’s slightly arthritic knee grew tired from his left foot tapping. He actually had to switch to his right. All in all, the entire performance is sharply and professionally performed, something that the Engeman has consistently presented to theater audiences. The John W. Engeman Theater, 250 Main St., Northport, will present “A Chorus Line” through May 10. Tickets are $69. For more information, call 261-2900 or visit www.engemean theater.com. “A Chorus Line” opened at New York’s Shubert Theatre in the summer of 1975 and, after logging more than six thousand performances, it became for a time the longest-running musical in Broadway history. The show, directed and choreographed by Michael Bennett, finally closed in the spring of 1990. It had garnered a dozen Tony nominations … winning nine! As if that were not achievement enough, “A Chorus Line” also nabbed the 1976 Pulitzer for Drama, and the Marvin Hamlisch triumph is still The Great White Way’s sixth most durable show ever. The story (whose all-important book was written by James Kirkwood Jr. and Nicholas Dante) delves into the aspirations, fears, and confessions, of seventeen dancers auditioning for some ‘forthcoming New York musical.’ Since all the action takes place on a bare stage in a Broadway theater, the easiest job for anyone on the production team is that assigned to Set Designer, Jon Collins, an artist who has proven time and again that he can handle anything requested of him. As for Costume Design: “A Chorus Line” is an inherently flamboyant affair that shows us exactly how an assortment of young people might plausibly be dressed as they present themselves for evaluation by a big-time musical producer. Accordingly, stylist Tristan Raines uses the show’s colorfully clad dancers to create an ever-shifting, constantly pleasing, pastel mosaic. What results is sheer magic … especially since the dazzling troupe is so expertly illuminated by Cory Pattak’s ingenious lighting. Veteran director Drew Humphrey could not have asked for a more adept team to assist him. “A Chorus Line” attendees shouldn’t conclude early on that what they’re in for in this Engeman production is merely a group of eager young hoofers doing their thing in vibrant terpsichorean rehearsal togs. Actually, that would have been enough to make for a superb theatrical experience. But as we watch, the musical builds beyond our wildest expectations … until ultimately it becomes an unforgettable production that is lavish in every sense of the word. Credit costumer Raines, who dresses the dancers perfectly, first in appropriate tryout gear, and ultimately in the lush, matching outfits that mark the musical’s vivid climax. The resulting contrast is breathtaking. It’s a radiant New York show through and through, this ‘Chorus Line’ phenomenon that’s currently mounted at Northport’s comfortable Engeman Theater. What, after all could be more representative of ‘The Big Apple’ a few miles west of us, than a diverse group of stage-struck performers seeking nothing more than an opportunity to strut their stuff before the world’s most sophisticated theater audience? ‘A Chorus Line’– one of Broadway’s longest running extravaganzas—just opened at the John W. Engeman Theater. Directed with finesse by Drew Humphrey, the show explores the elusive field of dreams of dancers competing for spots in a theatrical musical. Featuring music by the incomparable Marvin Hamlisch, lyrics by Edward Kieban, and the book by James Kirkwood and Nicholas Dante, ‘A Chorus Line’ is a unique backstage look at a Broadway production. It is no surprise that the show has garnered a plethora of awards: Tonys, Drama Desk Awards, and even the Pulitzer Prize for Drama. The plot focuses on the 17 hopeful (and desperate) young dancers who survive the first cut. Against the backdrop of an empty stage, they strut their best moves under the critical eye of the formidable director Zach (James Ludwig). The chosen ones (and there are only eight spots) must demonstrate that they can perform seamlessly in unison. Although we see Zach from time to time, for the most part he’s heard from afar, giving him an omnipotent presence. And lo and behold, resumes and publicity photos are not enough for Zach. Perhaps, driven by his own inner demons (and it will turn out that he indeed has some), he wants each dancer’s backstory. These self-revelatory monologues offer an intoxicating entrée into the hearts and the minds of the young dancers. For some, like self-possessed Mike (Eric Greengold) and Sheila (Kelly Sheehan), the poised and svelte veteran of many theatrical productions, disclosure comes easy; for others, it is a psychological striptease which peels away the exterior, exposing insecurities and the life experiences that led them to dance. The musical is full of energetic showstoppers and you’ll be hard-pressed to choose a favorite. “Dance: Ten, Looks: Three,” sung by Valerie (Stephanie Israelson) is a humorous tribute to the positive impact that medical enhancement of her feminine attributes has had on her career. In contrast, “The Music and the Mirror” is a dreamy interlude echoed in the floor-to-ceiling mirror in Jonathan Collins’s set. Cassie (Jessica Lee Goldyn who starred in the show on Broadway) is a former dancer who has failed at acting. Now 37 years old, she is not above begging Zach, who turns out is her former lover, for a spot in the chorus. Clad in a clingy red dress which hugs every curve, she auditions in private for Zach. Losing herself in the moment and her love of the art, it was almost as if she is dancing with her reflection, a figurative personification of her previously successful self. Goldyn’s execution and its impact are stunning. ‘One’ is indeed a singular sensation. I was particularly impressed by Cory Pattak’s lighting, which at one point bathed the dancers in multi-colors, obliterating their individuality and giving the impression that the ensemble was one big dancing machine. And bravo to Dena DiGiacinto for the outstanding choreography. “What I did for Love,’ sung by Diana (Maria Cristina Slye) and Company is a salute to the devotion to dance or any art form, cause, avocation, or occupation which is not about personal aggrandizement, fame, or fortune, but being part of a team and doing what you enjoy most. I have long admired the work of James Olmstead, who has done double duty as the conductor and on the keyboard in the past. He is once again at the helm and his band’s performance is flawless. Prepare to be wowed by a non-traditional curtain call which pulls out all the stops in terms of showmanship and glittery costumes. Kudos to Tristan Raines for this sheer delight. It was then that I was reminded that ‘A Chorus Line’ is a “show within a show” in the very real sense that the actors we applauded vied for their parts and made the cut. “A Chorus Line” runs through May 10. The Engeman Theater is located at 250 Main St., Northport Village. Tickets can be purchased at the theater’s box office, by calling (631) 261-2900 or by visiting www.engemantheater.com. A group of performers dance their hearts out for a chance of a lifetime to be cast in a new Broadway musical. As the play opens the audience is immediately captivated in sorting out what is happening before them. 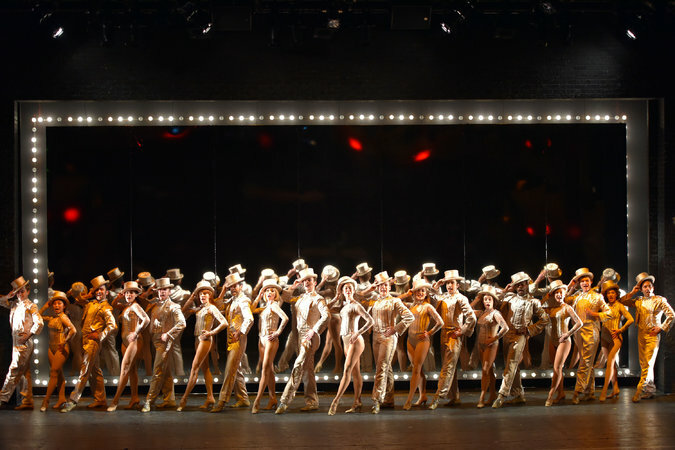 A Chorus Line is one of the longest running shows in New York theater history, breaking records, winning nine Tony Awards, seven Drama Desk awards and the Pulitzer Prize for Drama. It is considered one of the most successful shows on Broadway ever. 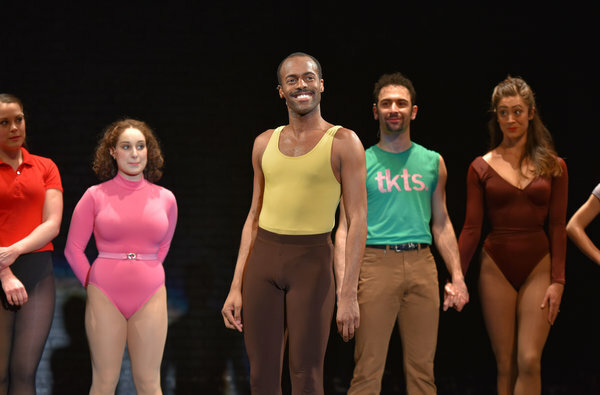 While watching the performance of A Chorus Line at The John Engemen Theater in Northport, audiences are reminded why this show is so memorable and timeless. It offers everything one could expect in a performance including drama, comedy, catchy music and dancing. 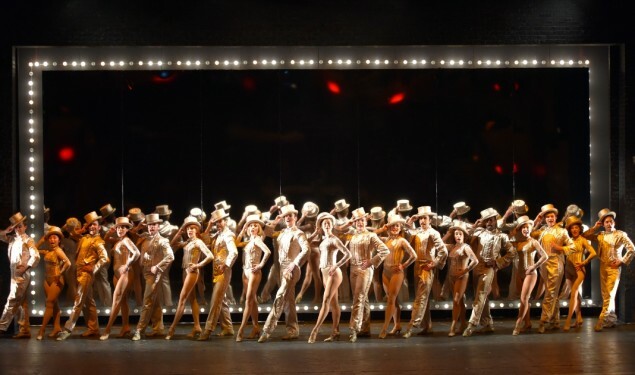 A Chorus Line’s fame has led to many successful productions worldwide. The performance currently running at the Engeman Theater can be counted among those successes. This rendition lives up the high expectation that one would expect from A Chorus Line. This can be attributed to a well cast production with strong talent across the board. Each member gives a solid performance of dancing, singing and acting. While the entire cast was talented and well suited for their roles, there are some terrific performances that stand out and are worth noting. A highlight was the excellent performance of “What I Did for Love” performed by Maria Cristina Slye who played Diana. One of the dancers named Paul falls and injures his leg and is forced to leave the auditions. Zach, the director, played by James Ludwig, asks the remaining dancers what they will do if they are not selected for this performance or if they can no longer dance. The consensus is they will never have regrets for choosing this lifestyle. At this moment, Maria Cristina Slye performs the show stopper and does a great job with it. Performing “What I Did For Love” as compared to the original is no easy task but Slye pulls it off. Maria Cristina Slye gave a strong performance as the feisty Diana throughout the entire show. Another standout was Cassie, performed by Jessica Lee Goldyn who gave a moving performance and a superbly performed solo dance number. We learn that Cassie was romantically involved with the director before she left town. After not finding success, she is back and desperate to be chosen. Goldyn successfully captures the desperation of Cassie and we find ourselves rooting for her to be one of the 8 selected for the show. Omar Garibay who played Paul had a moving performance as well. He reluctantly relays his heart-wrenching life story. Zach calls Paul on stage, and he emotionally relives his childhood and high school experience, his early career in a drag act, coming to terms with his homosexuality and his parents’ ultimate reaction to finding out about his lifestyle. Garibay does a great job with the character of Paul and his talent stands out. What makes the show so moving is that the audience gets to know the hearts and minds of the individual characters rather than having them remain as anonymous performers. We come to understand why dancing is so important to them individually as we learn about the events that shaped their lives. Caring about these characters brings watching the dance numbers to a whole new level beyond mere entertainment. The finale of “One” meets the high expectation we’ve come to expect from this number. The number begins with an individual bow for each of the characters, and the audience immediately rejoices in their accomplishment. What makes the finale so enjoyable is the strong performances given by the entire cast. After sharing in the painful parts of their lives it is especially rewarding to share this joyous moment with them. It reminds us that life can be joyous as well as sad. The finale is everything it should be and was very well performed. It leaves the audience feeling happy and satisfied. Treat yourself to this well done rendition of A Chorus Line performed at Engeman Theater and you will find yourself thinking about the characters and singing the tunes long after having seen it. For an artist, the craft can come easily. It’s getting the gig that’s the hard part. In 1975, “A Chorus Line” showed audiences just how excruciating the audition process could be. Forty years later, the stakes and sacrifices continue to be just as palpable at the John W. Engeman Theater in Northport, where the show opened late last month and runs through early May. The musical takes us into the world of a Broadway dance audition. The show begins with a large group of dancers rehearsing their new steps—the original Michael Bennett choreography recreated here by choreographer Dena DiGiacinto. But once the director, Zach (James Ludwig), narrows the chorus down to 17 dancers, the show turns into a psychological character study and a pseudo-therapy session. On the literally glowing white line on the stage, the actors physically become their respective characters through signature poses and costumes perfectly styled to match the original 1975 Broadway production. Despite mirroring the original, these actors were able to make the roles their own. Kelly Sheehan reveals a visceral vulnerability as the cynical Sheila, a dancer who makes it clear she is more woman than girl. In her “At the Ballet,” she is forced to come to terms with an upbringing of infidelity and domestic abuse. Sheehan allows us to feel for her anti-hero, but not so much that we lose Sheila’s scathing sense of humor. Rachel Marie Bell and DJ Petrosino also serve as comic relief as married couple Kristinie and Al, who constantly finish each other’s sentences. Kristine reveals that while she may be a skilled dancer, she can’t sing a note on key—resulting in Al’s having to be her melodic partner. As the stories wind down, Zach confronts the shy, but skilled Paul (Omar Garibay). 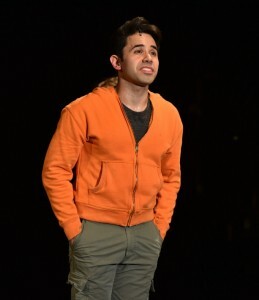 Garibay performs the show’s celebrated monologue with a perfect balance of apprehension and desperation to let his secret out. He recalls his parents finding out he was working in a drag show after they showed up to wish him goodbye. In a tearful release, Paul is alone on stage at his most vulnerable state until Zach comforts him. Goldyn, who played Val and understudied Cassie in the 2006 revival on Broadway, shows a radical maturity in embodying the despondent Cassie. Her dancing is stronger than ever as she seamlessly slips through the shadows of the stage, confronting herself in the mirrors. Each character in “A Chorus Line” knows they all have something to lose or gain. When Paul twists his ankle while rehearsing a tap number, the dancers come to the realization that their careers could end at any point. Still, they wouldn’t choose any other path because this is what they love, what motivates them to get up in the morning, and what keeps them alive. John W. Engeman Theater, 250 Main St., Northport. engemantheater.com $69. Times vary. Through May 10. This is one sensational show; get ready to be mesmerized by A Chorus Line at Northport’s Engeman Theater. Not only are the actors in top form, but everything about the show is faultless—from the spectacular dancing and the memorable songs (I Hope I Get It, I Can Do That, Nothing, One, What I Did For Love), to the poignant vignettes shared by each dancer. As the audience, we get a window into each dancer’s soul. Some share more than others, but by the end, we feel we know something about each one. And this theater experience is truly a sensation in movement, in song, and in memorable moments. A Chorus Line, with music by Marvin Hamlisch, lyrics by Edward Kleban, and a book by James Kirkwood, Jr., and Nicholas Dante, became the longest running musical in New York theater history until surpassed by Cats. It won nine Tony Awards, seven Drama Desk Awards, the New York Critics’ Circle Award, and the Pulitzer Prize for Drama. The musical will run at The John W. Engeman Theater through May 10, 2015, and plays the following performance schedule: Thursdays and Fridays at 8:00 p.m., Saturdays at 3:00 and 8:00 p.m., and Sundays at 2:00 p.m. Tickets are $69 and may be purchased by calling 631-261-2900 or online atEngemanTheater.com, or at the box office at 250 Main Street, Northport. The setting is the bare stage of a Broadway theater in 1975, where director Zach, played by James Ludwig, is casting for a new musical and will need to narrow down the contenders to four men and four women, out of 17 dancers auditioning for spots on a chorus line. As an audience, we feel like we are spying—we aren’t meant to be here—and this aspect has the audience glued to their seats. Ludwig has credits that include Broadway: Spamalot, Little Shop of Horror; Off Broadway: Two Point Oh, Blue Man Group, Bubbly Black Girl; Tours: Spamalot, 101 Dalmatians; Regional: Period of Adjustment, Raisin Cycle, God of Carnage, A Man’s a Man, A Christmas Carol, The Full Monty; Film/TV: News to Me, Lipstick Jungle, Chappelle’s Show, Ghost Town. We not only get a rare glimpse into a Broadway audition, but also the lives of those auditioning that unfold before us. The opening number, “I Hope I Get It,” shows how much each one wants the job, and the pressure is palpable. The director goes a step beyond the “typical” audition that usually requires dancing and/or singing proficiency. They must perform the right dance sequences, but they are also asked to be vulnerable and share something about their lives so the director gets to know them better. The dancers tell us that this audition is the chance of a lifetime, the opportunity to do what they have always dreamed about and worked so hard for their entire dancing lives. We learn about adolescence, “Hello Twelve, Hello Thirteen, Hello Love,” and homosexuality, being too short, and plastic surgery (“Dance: Ten; Looks: Three”). And we learn about veteran dancer Cassie, played by Jessica Lee Goldyn, who played the same part in the revival of A Chorus Line on Broadway. Other credits include at the Engeman: Damn Yankees; Broadway: A Chorus Line, On the Town, ADM21; National Tour: Fosse; Regional: Tuck Everlasting, South Pacific, Young Frankenstein, Chicago, Peter Pan, Crazy for You, Legally Blonde; Film & TV: Every Little Step, Smash. Cassie has had some success already as a dancer and a history with director Zach. He tells her she is too good to be in the chorus, to which she replies, “I need this job.” Goldyn dances brilliantly in the passionate “The Music and the Mirror,” and Zach lets her continue with the audition. Engeman’s dazzling show is full of so much talent and the casting team of Scott Wojcik and Gayle Seay deserves applause, too. Director Drew Humphrey has executed a musical masterpiece; he returns to the Engeman Theater with previous credits as director of Irving Berlin’s White Christmas and 42nd Street. Broadway credits for Humphrey: Irving Berlin’s White Christmas. Choreography is by Dena DiGiacinto, who has an extensive history with A Chorus Line, having played several roles in various productions, including the Broadway revival. Musical director is James Olmstead, who recently directed Evita at Engeman, as well as The Music Man, White Christmas, Sweet Charity, and South Pacific. Sheehan as Sheila, whose credits include Broadway: Irving Berlin’s White Christmas, 42nd Street. Other Credits: No, No, Nanette, Gentlemen Prefer Blondes, Singing in the Rain, Lady, Be Good, Bye, Bye, Birdie. Church as Maggie, Broadway: How to Succeed…, Irving Berlin’s White Christmas. Tours/NY: Billy Elliot 42nd Street, City Center Encores, Irish Repertory Theatre. Regional: Crazy for You, world premiere of Holiday Inn, Kennedy Center, NSMT, Atlanta TOTS, Hangar Theatre. Alexzandra Sarmiento as Connie: Regional & Tours: A Chorus Line (multiple including the West End Revival at the London Palladium), Cabaret (UK Tour),Fame (UK Tour). Michael Warrell as Don: Broadway/Workshops: All That Glitters. Tours: Spamalot, FAME, Grease. Regional: On the Town, Grease , Mary Poppins , Hello! My Baby. Other characters are Patrick Ball as Frank, Rachel Marie Bell as Kristine, Sissy Bell as Judy, Nic Casaula as Roy, Hayden Clifton as Greg, Matthew Couvillon as Larry, Courtney Fekete as Vicki, Omar Garibay as Paul, Francesca Granell as Tricia, Eric Greengold as Mike, Stephanie Israelson as Valerie, Andrew Metzgar as Bobby, Courtney Moran as Bebe, Pj Palmer as Mark, Dj Petrosino as Al, Sari Weinerman as Lois, and Danny Wilfred as Richie.